Soldan’s Pet Supplies has been your wild bird & wild life feeding headquarters since 1955. Nothing beats pulling up a lawn chair and watching the local wildlife in your own backyard. Soldan’s is well stocked in everything that you need to feed your local critters. Need a big bag but don’t want to deal with the hassle? We’ve got you covered. If it isn’t already available in a smaller bag, we will bag it down to any size you need and we will even load it into your car. Please remember that feeding wild animals does come with it’s own set of rules and regulations. We encourage you to become familiar with your local feeding regulations. For general wildlife questions, please e-mail DNR-Wildlife@michigan.gov or call 517-284-9453 (517-284-WILD). Soldan’s is a proud carrier of Nature’s Window Feed, bringing the wonder of nature right to your window. All Nature’s Window mixes come with a frequent buyer’s program. Black Oil Sunflower Seed – Oilers attract a wide variety of birds to your feeders. With thin shells, almost all seed eating birds can crack them open. The sunflower’s high oil content gives birds the energy that they need to live all year around. Striped Sunflower Seed – Often used by those who want to deter certain species from visiting their feeders. Striped ‘sunflower have a harder shell that is more difficult for some birds to crack. Sunflower Hearts – Many birders living in apartments or condos feed sunflower hearts to avoid the mess from sunflower shells. Attracts: Finches, Chickadees, Cardinals, Nuthatches, Grosbeaks, Orioles, and Robins. Tiny black seeds that are rich in oil that act as a great source of energy for small birds. A great source of protein & fiber. Be sure to offer other seeds since corn is a favorite to many species that should have a wider variety of seeds, greens, and bugs. Attracts: Wide variety of wild birds and wildlife. High in protein and fat & loved by birds of all kinds. Squirrels eating all of your bird seed? Try mixing safflower with your sunflower seed. Squirrels, blackbirds & grackles usually do not prefer Safflower’s bitter taste. Attracts: Blue jays, Woodpeckers, Grosbeaks, Finches, Doves, Chickadees, Cardinals, Nuthatches and more. High in protein and full of monounsaturated fat and nutrients such as Niacin, Vitamin E, Manganese and Folate. We carry: Peanuts in the shell, raw, hearts and splits for birds and other wildlife. 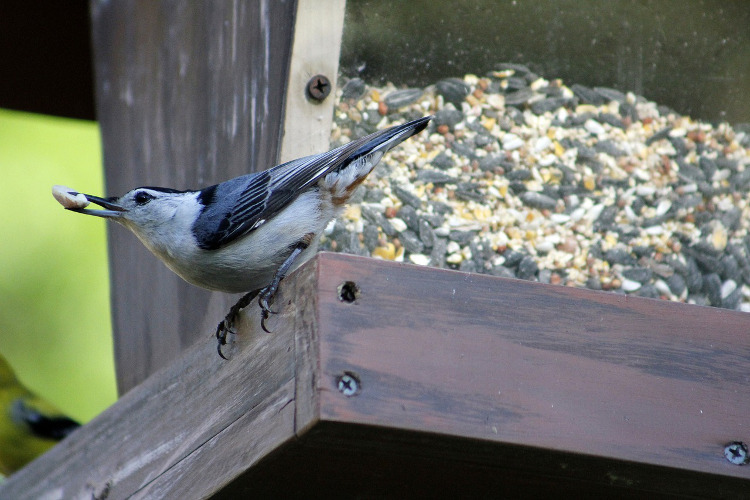 Attracts: Jays, Crows, Chickadees, Titmice, Woodpeckers, and variety of other wildlife. Click here to view the Nature's Window Feeding Chart. Sizzle N’ Heat: Premium hot blend made with chili peppers to deter squirrels from feeding at your feeders. Suet cakes, seed cakes, mealworms, hummingbird nectar and feeders, nesting boxes, unique and eco friendly bird feeders, squirrel baffles, Shepard hooks & poles, and more!